Disney is taking a new look at the little elephant who can fly. Following the success of films such as CINDERELLA, THE JUNGLE BOOK, and BEAUTY AND THE BEAST, Disney will unveil DUMBO next spring. The live-action film, directed by Tim Burton, reintroduces the floppy-eared flying elephant we first met in the animated feature — this time in an expanded new story. The themes presented in the original DUMBO — friendship, acceptance, and self-confidence — are timeless. They’ll be major factors in the retelling of the adored tale. Colin Farrell, Michael Keaton, and Danny DeVito are the human stars in Burton’s cast, but they all play second to our favorite young elephant. Let’s look back at DUMBO’s long journey from animation to live-action. Disney released DUMBO in October 1941. The animated feature film was the company’s fourth, and became a box office success long before it was enshrined as a classic. In the decades that followed, the film hit broadcast television and reached even more viewers through VHS and DVD releases. The adorable little elephant became a favorite character for multiple generations of fans. In 2001, rumors flew about a planned sequel which would focus on Dumbo’s father, Mr. Jumbo. The studio eventually scrapped the sequel idea, but kept the door open for a new opportunity. Plans for a live-action remake emerged in 2014, thanks to a pitch by screenwriter Ehren Kruger. A year later, Tim Burton signed to direct. The film shot in London. While principal photography wrapped over a year ago, post-production has been going on during all of 2018. Naturally, the big question was how Dumbo would look. 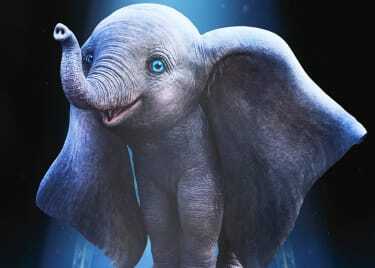 The CG-animated Dumbo looks as adorable as ever, and has some characteristics unique to this version. There might not be talking animals in this version, but Burton has proven time and again that he can evoke empathy and emotion with even the strangest characters. We expect we’ll have to swim through some of our own tears even before Dumbo takes flight. Disney and Tim Burton loosely based the new DUMBO on the 1941 animated film. 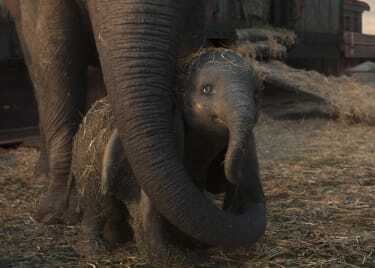 This story, however, will take a deeper dive into Dumbo’s path to stardom. It also gives a lot more time to the humans involved in two different circuses. As Dumbo becomes the main attraction at his first home, a struggling circus, he grows into more than just a performer for that outfit’s small family. It sounds like the first part of the film, with Dumbo finding his wings (so to speak) with the initial circus, is essentially a remake of the original film. 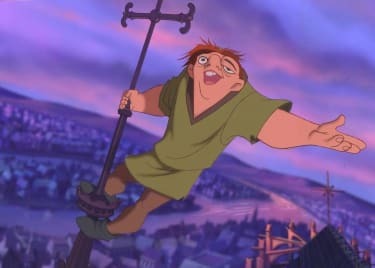 The trailer suggests many scenes that mirror the animated film. There’s even a hint of the iconic pink elephant scene. Some of the music, composed by Tim Burton’s regular collaborator Danny Elfman, also takes cues from the original film. The trailer features the iconic Academy Award-nominated song, “Baby Mine,” now performed by Norwegian singer/songwriter Aurora. But then all the rest of the story, with Michael Keaton’s semi-villainous character, is all-new material. Keaton’s character pulls the innocent elephant into a different adventure, creating a fresh set of problems for the people who love Dumbo. Let’s hope that Disney and Tim Burton allow Dumbo to rise high through any darkness, so that we can all shed happy tears by the end of the movie. DUMBO will soar into theaters March 29, 2019.